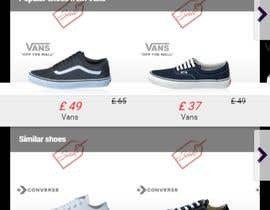 [login to view URL] is an online shoe store active in 11 European markets. With over 30 000 models and 600 brands we have shoes for every occasion. Our values fun, friend and customer are in everything we do. We want to have fun and be friends with our customers. We’re all about being easy, colorful and fun. Our communication is not about us - it’s about our customers. Since we are all about our customers, we love when they are spreading the word about us and our products on social media. And we want to show that content to other customers as well. Over the past months we have collected thousands of customers photos and now it’s time to publish them on our website so more people can get inspired by them. This is where you come into the picture. We want you to make a design proposal with a UI perspective on how we can display our user generated content on our product sites. We already have the database with user generated content and also the rights to show them on our site. Notice that we only want you to design how this could look according to the specifications below. 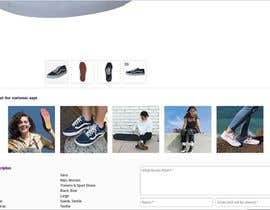 We want the user generated content to be nicely integrated and displayed under or together with our own products images. We want to display @userName and image text from source (instagram mostly) discreetly when the image is displayed in full size. Please check the attached file for example. Please see the attached example design which are in the right direction (but not 100% there). We want you to design the UI of how user-generated images are displayed on our product pages. We have very limited capacity to answer questions or give individual feedback during the project, instead we will give collective feedback - this will then hopefully help you get a better understanding of what we are looking for. Hi all, we need some time to go through all your designs and will get back to you within this week. Thank you for your patience. Please check entry #25 ( 3 different designs ). Hi all, thank you for all your work. I saw all of you had the idea under the product images and I would like to bring another idea up. Would it look nice when you combine the product images and UGC and display them in the same way? It would be nice if you can try out this and we will see if it turns out better. Many thanks! Working. please don't close early. Hi all, It might be a little bit confusing with the description. We only want the UCG part design, the rest of the page should remain the same. Thanks! can you explain what it is UCG part? Here are some more guidelines for the contest since some of you think it is confusing with the original description. -- You should only design the UGC part. The rest of the page should remain the same. -- We want to the user pictures display together with/under the product images and how you present the pictures is up to you. We are happy to see your nice ideas. -- We prioritize mobile design. However, you should submit the design in both the mobile and desktop view. -- In your design, you should show how you display pictures when there are only one and when there are many. -- It should be clear for the customers to see which are product images and which are customer pictures. -- When customer pictures are clicked, the full-size picture should be displayed just as the product images. -- User information in the form of @userName should be seen when full-size pictures displayed but discreetly. Hope these points can help you to get a better idea of what we want. Thanks! Hi all, It seems the attached file I uploaded was not successfully added. I will fix this in a little while. Thanks! Hi can you please recheck? No attached file. Hi all, I have updated the contest description. Please check it out and start working on it. Looking forward to your designs. Cheers!